For Architecture, Structure and MEP 2012/2013. 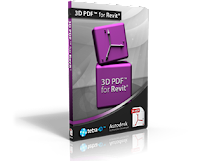 3D PDF for Revit allows easy sharing and archiving of Autodesk® Revit® design and construction data with anyone, anywhere. All they need is the free Adobe® Reader. Easily create and share interactive 3D documents enabling everyone from clients, to sub-contractors, building owners, and beyond, to participate in the building information modeling process (BIM). Share design information without putting your source model at risk or requiring recipients to download unfamiliar viewer applications. The free Adobe Reader is installed on 98% of desktops worldwide so it's easy to share all design data in the universal 3D PDF format. With up to 97% smaller files than the original 3D model, you can easily conduct design reviews electronically. tetra4D is THE Source for 3D PDF Technology. As the exclusive provider of 3D technology for Adobe® Acrobat®, tetra4D provides customers best in class solutions to combine the value 3D CAD data with all the benefits of PDF document management and data archiving. Let tetra4D and its global partners help you configure a 3D PDF based solution specific to your unique business processes. There's more information available on the Tetra4D website.